I went to London on Friday to meet a friend. The weather was so summery that we bought a picnic lunch and walked to St James’s Park where we sat watching the world go by while we caught up on our news. It was blissful – London at its glorious, cosmopolitan, easy-going, bonkers best – and it was wonderful to see my friend; she is a tonic. Instead of coming home on the usual train, I went to meet David and travel home with him (we find our time when we can!). On the way we took a small detour via Wisley, arriving about an hour before the gardens closed, for a short walk and to avoid the worst of the Friday rush-hour traffic. Late afternoon when almost everyone else has gone home is quite possibly one of the best times of the day to visit. 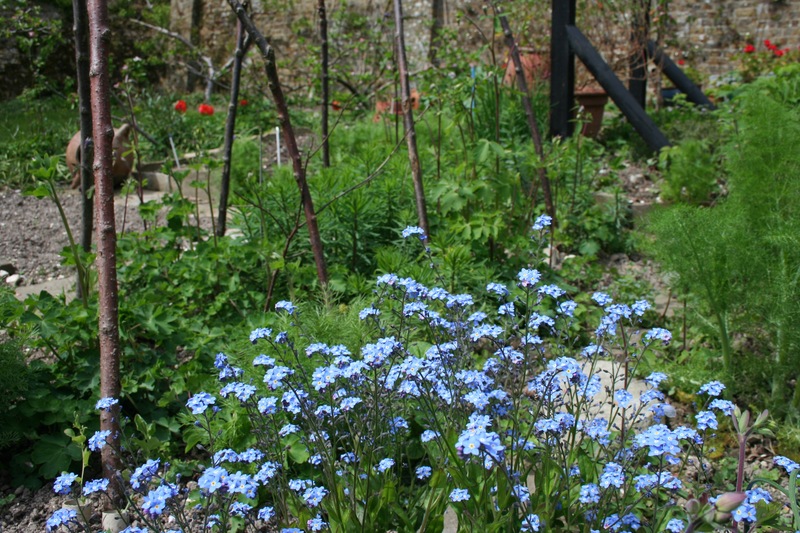 As we strolled along, enjoying the novelty of the near-empty garden, we caught sight of a sea of blue flowers. Bluebells? No, not in this part of the garden. What, then? Camassias, that’s what. 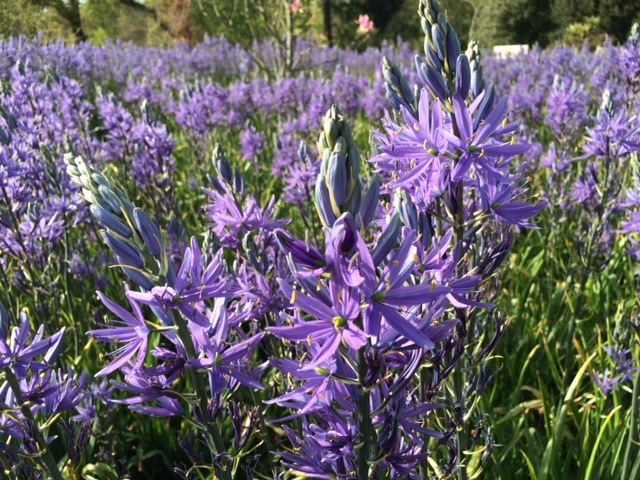 A huge swathe of Camassia leichtlinii subsp. 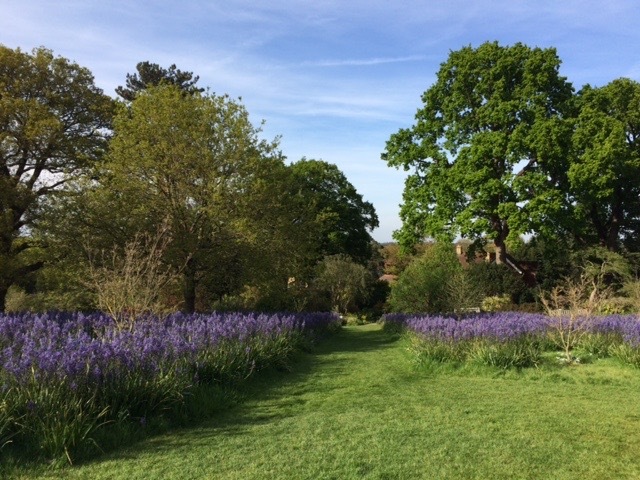 suksdorfii (Caerulea Group) and Camassia cusickii which is the result of letting the bulbs naturalise in the grass in this part of the garden for the past few years. I’m not familiar with this lovely plant but, funnily enough, there was a feature about Camassias on Gardener’s World on Friday evening, too. The nurserywoman interviewed extolled their virtues as a fabulous garden plant for practically every condition. Seaside chalk? I’ll look into it. How has your weekend been so far? It’s been warm, sunny and positively summery here but very annoyingly I have a stinking cold (or it could be much-worse-than-usual hay fever), so I’m not enjoying the balmy conditions as much as I usually would. I’ve hung out several loads of washing and I’ve pottered. That’s about the sum of it. And I’ve taken a few photographs to show you what’s looking lovely in our garden at the moment. 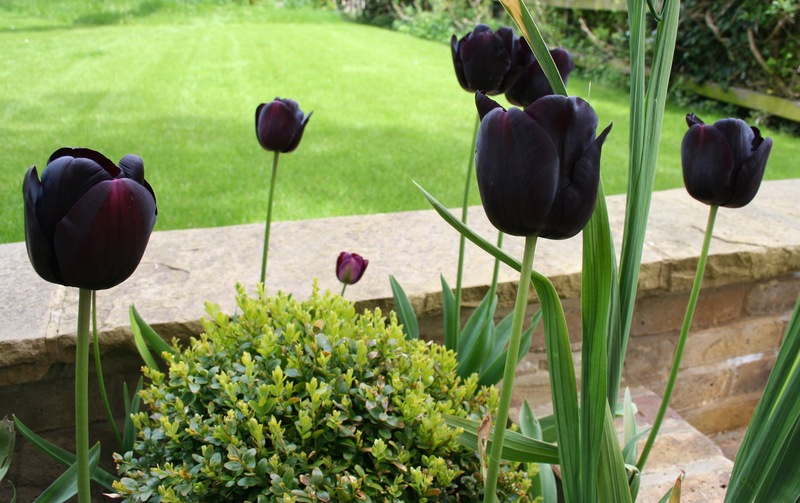 I’m ashamed to say that I can’t remember which tulip this is. It looks like ‘Queen of the Night’ but I could be wrong. Anyway, whatever, I love the colour and the way it stands out against the new box foliage and the green grass. Our apple blossom is coming out. I do love how the tight buds are deep pink and the petals white, blushed with pink. Apple blossom fills me with spring-y happiness. This clump of forget-me-nots has been flowering for weeks. It positively glows in the early morning sunshine or late evening gloaming. Likewise, the pulmonaria, which has been flowering for months now. It’s constantly buzzing with bees, so whatever you think of it, it earns a place in our garden for being such a good plant for pollinators. I tried to photograph a bee but this one wouldn’t keep still, so it’s a black smudge. You can just make out its pollen-laden thighs if you look closely. 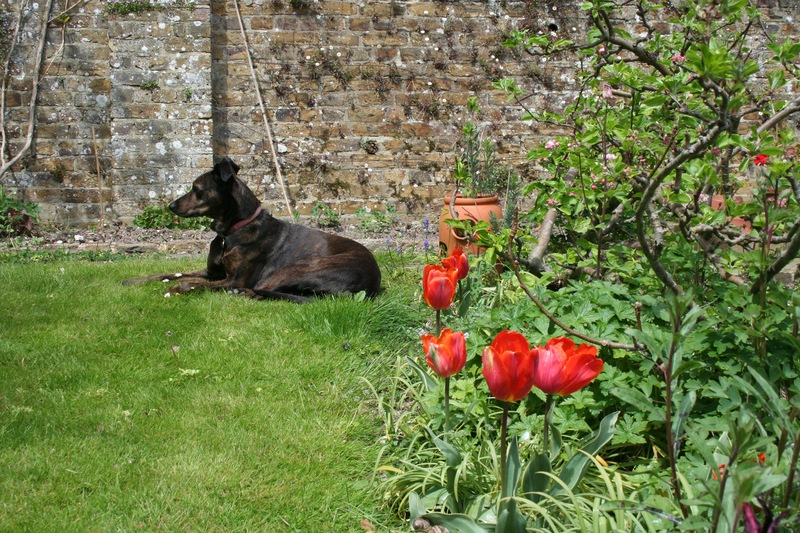 Cassie, enjoying the hazy sunshine, Tulip ‘Arjuna’ among fading snowdrop foliage, and fresh geranium and gaura foliage. Erigeron is flowering on the wall in the background. 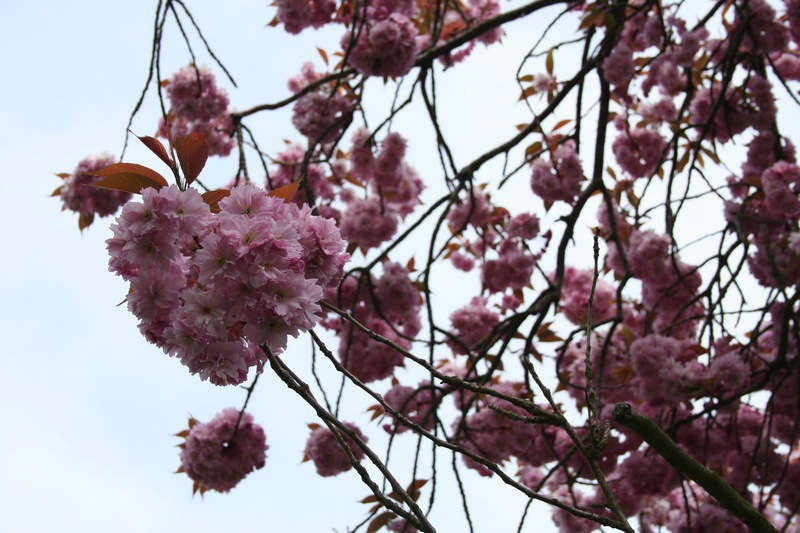 Our cherry tree is in full, blowsy, frothy bloom. Petals sprinkle down whenever there’s a gust of wind and settle into the creases and folds of the laundry on the line, and the lawn is dappled with pale pink confetti. Floriferous indeed! I need to plant myself some Cammassias. Yesterday the weather started with thunderstorms then turned merely cloudy and chill with winds blowing the petals off the crabapple trees. Today is sunny – still a bit cool, but nice. All looking beautiful and spring-like (at last). 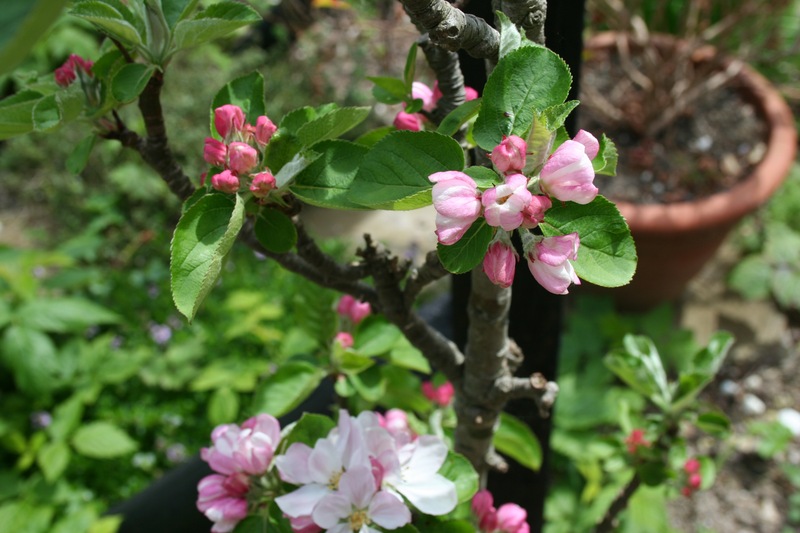 Apple blossom truly is a thing of beauty. Your flowers are beautiful, Sam. I love those tulips and the apple blossom looks so pretty. I would really like to see bluebells in person someday. I know that they grow prolifically in parts of Texas in the spring; I assume they’re the same type you have in England too. It’s funny, though, because until I began reading English blogs, I thought “bluebell” referred to grape hyacinths, or muscari. That’s what I called those when I was a child and didn’t realize there was a whole different flower that actually has that name. I hope you have a good week ahead. 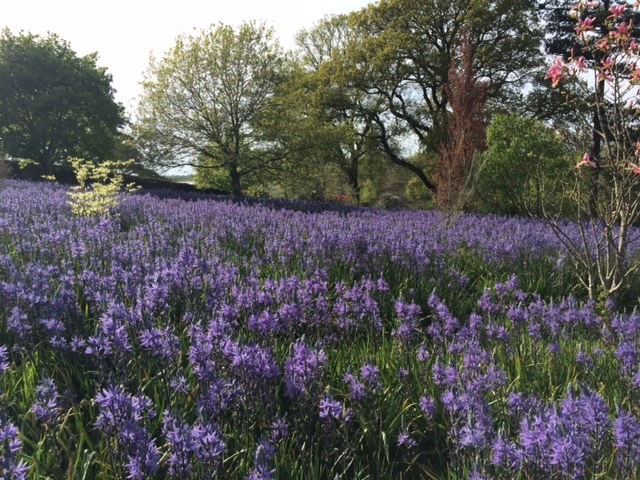 Drifts of camassias are the way to do it, if you have the space. I have just the one and it looks rather wimpish on its own. The trouble is they are over so quickly. Get well soon, lousy time to have a cold! Thanks Jessica, I’m almost 100% again. I’m sure just a few camassias wouldn’t look nearly as impressive as a huge drift. Interesting to know they’re not around for long. I watched that Gardener’s World and had the same thought. I’m not sure that I have ever seen any naturalised like this. Lovely Spring-y pictures. I hope you are soon feeling better. Thank you, Brian. I am. I love camassias and they do spread nicely. It is a pity that the flowers don’ t last longer. Lucky you going to Wisley, it is always a treat. Apple trees are one of my springtime favorites. There’s something about those pink buds against the new leaves that makes my heart glad. Yours are lovely. Gorgeous! I’ve just moved to London so it’s great to find some tips on the best places to visit. I’m glad I found your blog. Hello Janna, welcome 🌞. I hope you’re enjoying London. The parks come into their own at this time of year. The native camas is a staple feature of the Garry Oak meadows that were once so common here (before colonisation) and there bulbs figured importantly in the diet of First Nations people in the Pacific Northwest, particularly in the coastal region — with great care to harvest when flowering as the white camas is poisonous enough to have “Death Camas” as its common name. . . 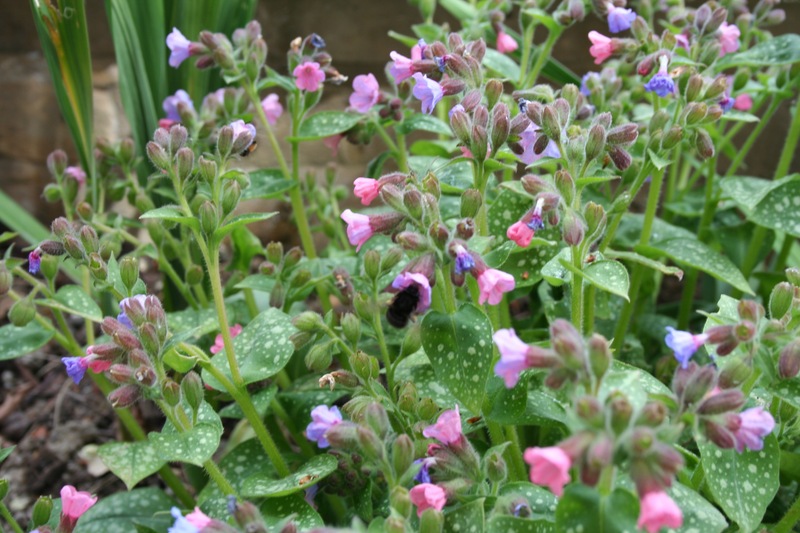 Your photos make me wonder why I haven’t seen any pulmonaria in the garden for a couple of years. . . it’s not a plant I’d consider at risk! and I definitely used to have some. I’m a sucker to so many of those older, cottage-garden plants. Your photos are so lovely — thanks for sharing them. Oh we were struct by the Camassias on Gardener’s World too. Lovely photographs!